Was out on the flats from thursday around noon to sunday around noon came out with 24 also the friend I was with did the same. Looked to be a lot of birds moving in. I was done in 2 hours on sat.. Saw quiet a few large flocks some I would guess in the 500 or more. The next 2 weeks are going to be gandbusters on Swans and Geese out here. Oh sure rub it in. If we could only kill swans here. That would be awsome. Allen, it has been awesome and will continue with this colder weather. 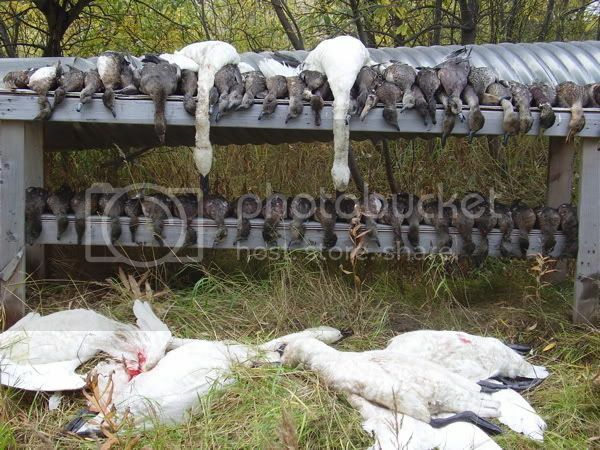 I'm not much of a goose hunter, but we sure have put the hurting on ducks and swans. Almost everyone in our group is filled up on swans and the ducks.....man the ducks. Rafe I haven't been out yet. On 2 weeks vacation now so I get to get out. Allen remember don't "smoke the whole flock" of swans Just three LOL They are not wolves!!! Man you guys are killing me!! I haven't been able to get out since opening weekend. Our weather changed last Friday. Daytime temps have been in the mid 40's and we have had frost almost every morning. I'm in Bethel. Are the swans good to eat? Yes, but not as good as Cranes. A swan and cranberries from the tundra will more than compete with any turkey dinner for Thanksgiving!!! Cranes are better, but harder to get out here. I like to take my swans, crock pot them with some beef broth until it all falls apart and off the bones. I then put it on buns with some horseradish and mustard and eat it like hot beef. It is delicious!